New Zealand has a rich diversity of native flora. As a result of its geographical isolation thousands of years ago, New Zealand developed a unique vegetation. In fact, 80% of its plants are endemic, found growing naturally only in New Zealand. It is world famous among botanists for this reason. In particular, New Zealand has an unusual number of flowering trees, such as the Rewarewa, Kamahi, Manuka, Tawari, and Pohutukawa. Prior to the introduction of the honey bee to New Zealand by European settlers about 160 years ago, these trees relied on birds for pollination and as a result, they produced abundant nectar sources. It is through the honey collected by bees that we can sample the remarkable subtlety of these flowering trees and plants – a taste of the very land itself. New Zealand has a clean, green environment with open spaces and large areas of native trees and pastureland, ideally suited for bee foraging. The air is clear and free from industrial pollutants. As people become increasingly health conscious and seek purity in food, free of chemical residues, New Zealand honey holds special attraction. Being a remote island country with strict border surveillance at all ports of entrance, New Zealand beekeeping has avoided many of the bee diseases found in other countries. The routine feeding of antibiotics for control of such diseases as European Foul Brood is a widespread practice in most other beekeeping countries but it is illegal in New Zealand. In addition to this, New Zealand has maintained a nuclear-free status, eliminating any possibility of radiation contamination in its honey harvests. Research has shown that the honeys coming from the tree flowers of New Zealand have an unusual composition, containing high levels of phenol compounds. As a result many NZ honeys have significant antioxidant, antibacterial and anti-inflammatory properties. New Zealand’s UMF® trademark for Manuka honey, identifies this Unique Manuka Factor and rates the honey’s antiseptic potency, by comparing it to phenol. New Zealand beekeepers are highly skilled, well educated and well informed about international beekeeping trends, research and developments. The industry has in recent years broadened the range of the National Beekeepers Association which, for over a hundred years, has covered professional and hobby beekeepers. The new identity, Apiculture New Zealand, now includes all stake holders involved in the New Zealand honey industry, giving greater cohesion and direction. New Zealand is a developed country with stringent standards of hygiene demanded in the handling of food products. In the case of honey, regulations cover the extraction of honey right through to its final packing, all of which must be done in premises registered and complying with New Zealand Food Safety Authority regulations. Control measures make it compulsory for all honey processing plants to operate under a Risk Management Programme, and ensures that all New Zealand honey can be tracked from production hives to the marketplace. 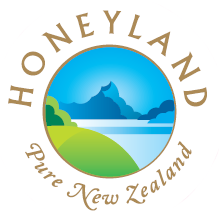 New Zealand honey is recognized as being of high quality, totally pure, a low moisture level and is viewed as a premium honey in international markets. Honeys differ in colour, aroma and flavour depending on what blossoms the honey bees visit in search of nectar. Honey colour ranges from almost colourless to dark amber brown and its flavour varies from delectably mild to richly bold. Honeys from forest floral sources are darker in colour and rich in flavour. Honeys from field floral sources are lighter in colour, with a delicate, fine flavour. Honey can be presented in a variety of forms including comb, liquid, and creamed. Comb honey retains its natural form, coming directly from the beehive. The large frames of honey comb are checked for quality and sections are cut out by hand. For liquid honey, the frames of honeycomb are spun in a centrifugal extractor, and this is carefully strained and packed. To produce creamed honey, the honey is cooled, slowly stirring in a finely- grained honey to begin the crystallization process. Under regulated temperature control, the honey granulates, resulting in a smooth, delectable creamed honey.